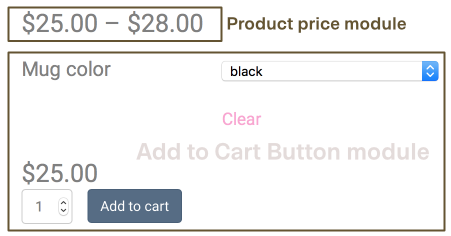 The Product Price module is in the WooCommerce modules category, which appears only when you're editing a Singular-type theme layout in Theme Builder and you've assigned a single product page as the location. Like the price display on the default WooCommerce product page, when the product has variations with different prices, the Product Price module displays the price range. The exact price after an option is selected is displayed in the area handled by the Add to Cart Button module, as shown in the following screenshot.